All About The 2018 Howl At The Moon Indie Music Festival: The Premier showcase of independent music. Q. 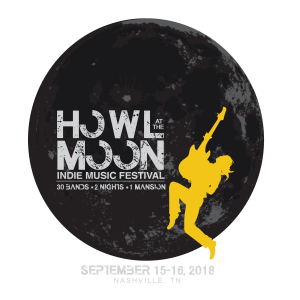 When is the 2018 Howl At The Moon Indie Music Festival? A. Our 2018 Festival is Saturday, September 15 with bands playing from 2:00PM Central Time to 10:30PM and Sunday, September 16 from 2:00PM Central Time to 8:00-PM. Q. Where is the festival? The 2018 Howl At The Moon Festival is at it's new home at the historic Two Rivers Mansion's main lawn. The Mansion is located at 3130 McGavock Pike, Nashville, TN 37214. Click here for more information about the mansion. Q. How do I purchase tickets to the festival? Early Bird Tickets Are On Sale Now!!! Click here for ticket information! Q. Is the Festival kid friendly? The music will generally be "radio friendly." However, live music can be spontaneous so we leave it up to each parent to decide. Q. Is the Festival pet friendly? Please leave the pets at home. We will of course accommodate any service animal. Q. Will there be food and beverage for sale? We will be featuring several local food options at the festival. We will also have on-sight beverage sales. Full food and drink information will be added to its own page soon. Please support our local vendors. No outside food or beverages will be allowed. Q. Do you have any festival merchandise for sale? We will have some awesome merchandise on sale at the festival. Even better, select one of the many pre-order options that will be available when ticket sales go live! Q. Your name says "indie music festival." What type of music do you have at the festival? The indie in our name is for independent music artists. Last year's festival included southern rock, alternative rock, country, Americana, Christian rock, hip hop, and everything in between. Follow us on Facebook and Instagram to get the latest information on our upcoming 2018 lineup releases. Q. How do I become a 2018 Howl At The Moon Indie Music Festival Sponsor? We couldn't do it without our sponsors. Please take a look at our sponsor page and fill out the sponsorship information form. Q. How do I become a vendor at the festival? Everyone would be hungry and not have trinkets to buy without our vendors. Please visit our vendor page and fill out the vendor information form. Q. How do I apply for press/media credentials? Working press/media on assignment are encouraged to cover all of the independent music fun by apply for press credentials here.